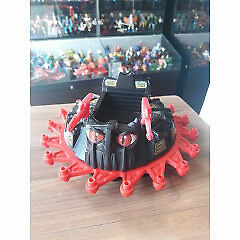 Hi, I’m interested in 1983 Complete Roton Evil Assault Vehicle of He-Man-Masters of the Universe#100 (MOTU) Vintage. Please contact me. Thanks! This set has not been used. The pieces are still sealed in the original bags. Welcome to the world of imagination and creativity. With this Moviemaker Set, you have a gift that can lead you to hours of fun and accomplishment. You may not even realise that when playing with your own toys, you have already been telling stories. Now you have a chance to share with your friends the stories you have been telling all these years. There wasn't anything like this when I made my first films as a young teenager, so you already have a running start. The Moviemaker Set handbook, filled with instructional tips, can help you step by step towards making your own movies. Yet, all the instructions, the digital camera, the packages of bricks and props, your personal computer are just the tools. The most important elements are in your imagination, where all ideas begin. Get the most out of those ideas by developing them into stories. You can do it with the characters and situations that you invent; the settings; your camera angles; your movements; your sounds; your music; and visual effects. Personal movie-making is all about the choices you make. You are the storyteller. You're totally in charge. You have final cut. May the Moviemaker Set give you hours of enjoyment and, who knows, perhaps a desire to some day tell stories for a living. --Steven Spielberg, in his endorsement for the Moviemaker Set. All Spielberg's proceeds are donated to Starbright Foundation and Shoah Foundation. Priced to clear - prices range on e b a y up to R11000!